Oregon Scientific RM338PA-BK PROJI Projection Clock with Dual Alarm - Black radio-controlled clocks are both easy to read and operate. The LCD screen displays the current time, day and indoor temperature in large font making a quick glance at the time, easy. Never have to set the time again with the RM338PA PROJI radio-controlled (atomic) alarm clock with projection. The RM388PA receives the time and date from the atomic clock so it automatically updates at the start and end of Daylight Saving Time. Never have to set your clock again! Why fumble in the dark or have to switch the light just to see the time. An adjustable projection arm with 180 degree flip projection image means you can project the time and temperature on a wall, ceiling or any angle that suits your eye level. With a simple tap on the snooze/light button the time is projected onto your wall/ceiling. For continuous projection simply power the clock using the included AC power adapter. Hate leaving your warm bed only to discover just how cold your bedroom is? 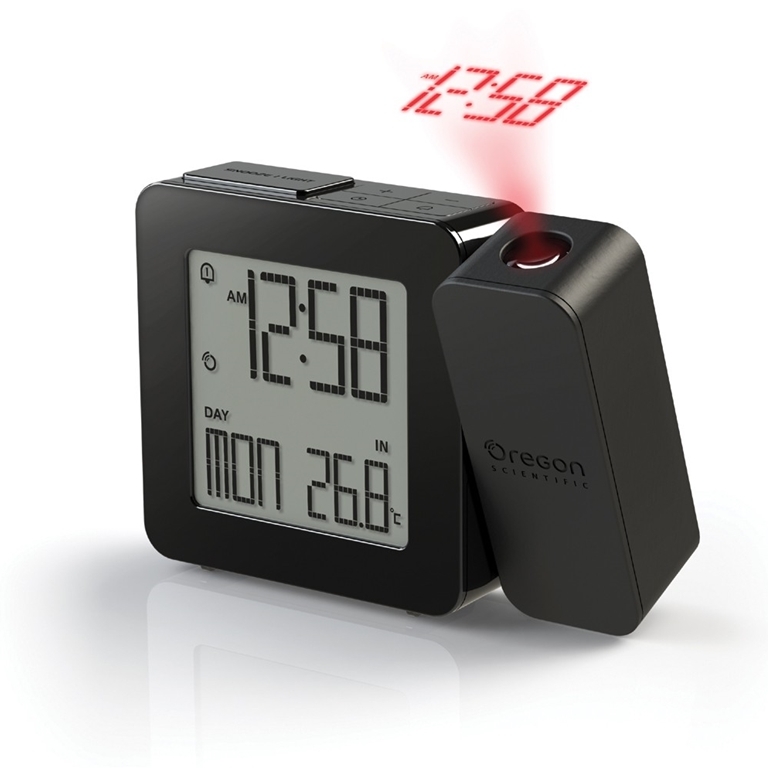 This Oregon Scientific projection clock also measures the temperature of your room. The dual alarm function allows you to set two alarm times on a single clock keeping you on time whether it's the weekday or weekend.